It’s a Thursday afternoon and I couldn’t be more excited to sit down with Margie Coyle at an Austin institution, Enchiladas Y Mas, and learn about her story, as well as another Austin institution: Cap City Comedy Club. Born and raised in Garland, Texas, Margie Coyle moved to Austin in 1983 to attend the University of Texas. She had initially dropped her classes while working at Paine Webber as an assistant. Regardless, she passed the Series 7 Exam, a very long and difficult test, to become a stockbroker. Being denied a license because she did not have a degree, was the motivation she needed to go back and complete her studies. I had to know, given that determination and interest to pursue finance, how did she get into the comedy business? Coyle got her start while waiting tables at, what was then, The Laff Stop. Her husband, then boyfriend, was bartending downtown and was offered tickets to see hypnotist Richard De La Font (they were all the rage in the 80’s), at The Laff Stop. A friend told her the club was hiring servers and she applied as a way to earn extra money. She graduated UT with a finance degree in 1987 and continued working at Paine Webber by day, and waiting tables at The Laff Stop at night. Like any young college grad, Coyle didn’t really care for the early hours Paine Webber required. As luck would have it, in 1989, Angela Davis, the promotions person at Laff Stop, decided to move to LA. Ross Jackson, Laff Stop’s manager, offered Coyle the promotions job. For a time, she continued to work promotions for the club by day and wait tables at night. Not long after, she became manager of the club. In 1995, Bruce and Colleen Barshop bought the club and changed the name to Cap City Comedy Club. They were the owners until New Year’s Eve of 2002, when Coyle and her husband purchased the club, along with partners Rich and Lisa Miller, Colleen McGarr, and Duncan Strauss. She remembers her “…proud day as an owner of a comedy club. It was New Year’s Eve of 2002 and both sinks in the women’s restroom were leaking and I was sick.” You can imagine the “what have I gotten myself into” feeling of that night, but Coyle had already been managing the club for years in addition to being the talent wrangler for Club Soda in Montreal from 2000-2002, so she was a pro. “Pro” being my words, not hers. Coyle remains humble, despite the years of working with some of the greatest in the business. While she refuses to take credit for the careers of any comics, I can clearly see the joy Coyle takes in having watched comics like Howard Kremer, Brendon Walsh, and Martha Kelly launching their careers in Austin. “There’s nothing more fun than sitting in the lounge and watching the truly funny ones have their moment,” Coyle says with a smile. I can hear the love in her voice, that at times sounds like a proud parent and sometimes a dear friend. The first time she saw Martha Kelly she was at the Velveeta Room and Charlie Shannon said, “You have to watch this girl!” Clearly, she was impressed, as she went on to manage Martha Kelly for a time, among others, including Megan Mooney. Coyle beams, as she recalls the early years of Mooney’s relationship with her husband, Eddie Gossling. Gossling was scheduled to perform the night of 9/11. Coyle remembers the emotional conflict while trying to decide whether or not to have the show. That Tuesday morning she remembers driving on the freeway and listening to Dudley and Bob on 93.7 KLBJ. Dale Dudley kept talking about “the towers” being hit, but she did not know what he was referencing. She called Gossling in San Antonio and woke him up. He turned on the television to discover what was unfolding in New York. Ultimately, they decided people needed to laugh and the show must go on, so Gossling took the stage and the show was a success. Margie Coyle shares a story of Ron White, who spent his early years in Austin. Yes, that Ron White, years before the Blue Collar Comedy Tour. Around 1994, Cap City had agreed to do a Sunday night fundraiser at the behest of a headlining comedian. The Friday afternoon before the event, the headliner’s manager called to inform them he could not do the show. Coyle remembers calling Ron White, who at the time was living in Mexico, and asking him to step in and headline the event. White got in his car and drove in from Mexico just to do the show. It was a favor she never forgot. In our discussion, I mentioned to Coyle that Cap City seems to retain a lot of their staff and almost has a family feel to it. Her reply: “I try to surround myself with good people.” She describes her philosophy: “Treat people like you want to be treated, treat them like adults, do the job and that’s all you really need, right?” She credits a lot to Chandy Popp Kurzweil, who’s been there over 15 years, and Marc McManus and John DeMayo who have both been there over twenty years. Last year, the club renamed the front lounge “Andy Ritchie’s Balthazar Lounge,” after the late comedian that performed and worked there, early in his career. After being at Cap City week after week for years, I can say each time I walk through the door, I feel at home. Now we are approaching the busiest time of year when Moontower Comedy Festival and Funniest Person In Austin (FPIA) begin and overlap. Coyle remarks how Moontower has grown quickly in the short time that it’s been around, which she credits largely to her business partner Colleen McGarr, a Montreal native that grew up around the largest comedy festival, Just for Laughs. While Moontower is very important to Coyle, it seems that FPIA is still her baby and she adores watching young comics emerge. As the person that books the feature acts for the club, Coyle says that is the time when you get to see all the new and young talent. “That’s where you see Raul Sanchez and Martha Kelly and Andrew Dismukes and Vanessa Gonzalez… that’s where you see those guys.” As she talks about seeing new talent, Coyle lights up and you can see this is where her passion for the comedy business resides – being there to see a comic’s career begin. Now in its 32nd year, the competition draws judges from around the country to come and decide who will wear the crown and cape. Finally, as we finish our chips and queso, I ask Margie Coyle if she thinks the Austin comedy scene will ever rival that of New York City or Los Angeles. She believes it’s going to happen “with or without Cap City, it’s gonna happen.” Coyle pauses and then adds, “Let me take that back, there has to be ‘a Cap City,’ there has to be a venue which serves people like Anthony Jeselnik that want to come and play an intimate show.” I couldn’t agree more. 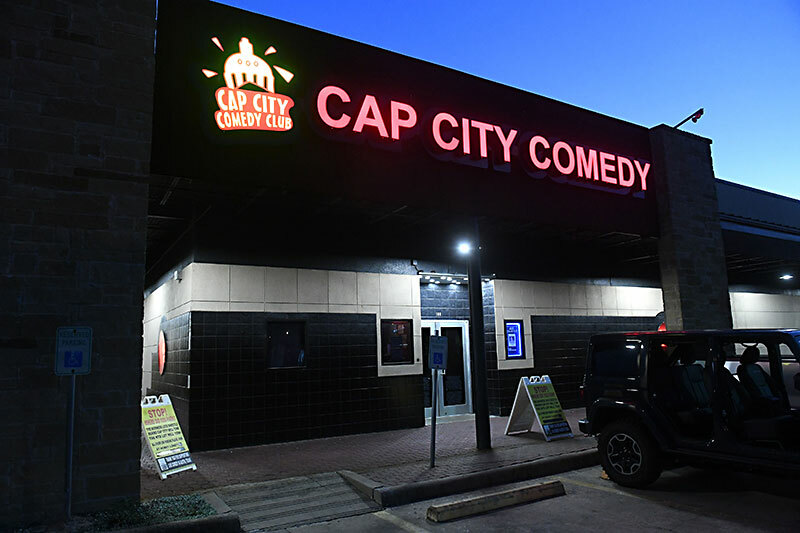 For a complete list of everything going on at Cap City Comedy Club, all you got to do is click this link. Stuart Goldsmith: But Are You Happy?